N'Damukong Suh, formerly of the Detroit Lions, is on the field before the start of their NFC Wild Card Playoff game against the Dallas Cowboys at AT&T Stadium on Jan. 4, 2015, in Arlington, Texas. 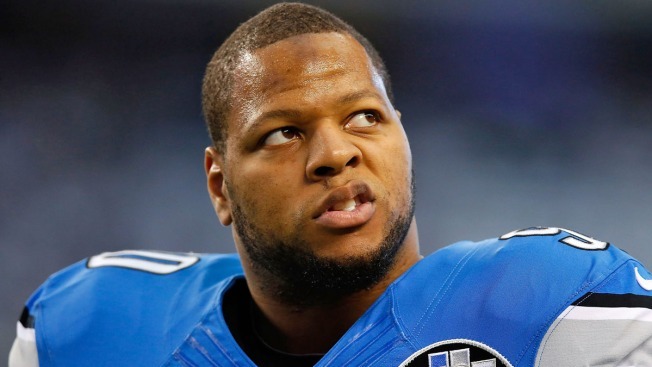 With teams now able to talk to free agents, the Chicago Bears have yet to make a splash on the free agent market, but one of their closest rivals has seen their roster take a huge hit as the Detroit Lions lost defensive tackle N’Damukong Suh to the Miami Dolphins. The deal, which was first reported by ESPN’s Chris Mortensen, will reportedly make Suh one of the highest paid players in the league, with $60 million in guaranteed money going his way. That number is second in NFL history, trailing only the $61 million guaranteed that Colin Kaepernick got from the San Francisco 49’ers, and although it’s undoubtedly going to be dwarfed by the deals Russell Wilson and Andrew Luck will get from their respective teams, it’s still a substantial investment by a team looking to make their way up the AFC East ladder. More importantly for the Bears and their fans, however, the Suh deal is one that opens the door for the team to move up in the NFC North. The Green Bay Packers continue to be a strong team as they were able to secure one of their big free agents to a new deal, with Randall Cobb reportedly re-signing for four more years in Wisconsin, but losing Suh puts a huge hole in the middle of the Lions’ stout defense, and it’s going to be nearly impossible for the team to replace him adequately. That weakened defense could take another hit if the team doesn’t end up re-signing defensive tackle Nick Fairley, who is also set to hit the free agent market. Losing both pieces up the middle on a defense that was the league’s best at stopping the run last year would really hurt the Lions, and it gives the Bears an opportunity to climb a run on the divisional ladder. All of that being said, the task facing Ryan Pace and John Fox remains a complicated one. The team does have a decent amount of salary cap space to work with, but there are a lot of holes that are going to have to be filled with that money. A new cornerback is a must with the departure of Charles Tillman and the struggles of Kyle Fuller and Tim Jennings. Safety continues to be a need and is even more of one now with Chris Conte leaving the team. Linebacker is a massive question mark with Lance Briggs leaving and the team not having a ready replacement up the middle or on the edges as they switch to a 3-4 defense. Even the offense has a question mark or two, with the addition of a secondary running weapon and a new wide receiver on the list of needs. Even with all of those gaps to fill, the Bears have some high draft picks to use, and their free agency money should help as well. Pace has a big test on his hands, but with the Lions taking a hit, there is room to move forward if the team wants to try to be competitive in 2015.